I made this for a friend who came for lunch with her kids. I didn't think kids would like a spicy lentil soup, so I made them quesadillas. Surprisingly the kids tried the soup and ended up finishing it off. There were a lot of quesadillas left. Heat a large pot over medium/high heat. 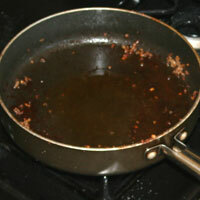 Brown sausage and cook through stirring occasionally. 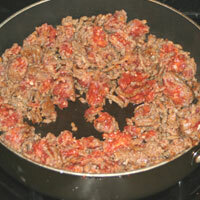 Remove sausage from pan and set aside until right before serving. Refrigerate it if it will be several hours. Chop the onion, carrot, and celery and set aside. I like to brown the sausage first in the pan so the vegetables can have the sausage flavor. I then remove it so it retains it's flavor. If it simmers in the soup for an hour it drains the taste and leaves it rubbery. Also, this soup is mostly pureed and you don't want to puree the meat. Measure the garlic and spices and set aside. Return the pan to medium/high heat and add the olive oil. When oil is hot, but not smoking add the onion, carrot, and celery. Cook stirring frequently 5-7 minutes. Lower heat if vegetables are browning excessively. Add the garlic and spices and mix well until the garlic is aromatic. Add tomatoes, red lentils and half the chicken stock. Simmer 15 minutes. Puree using an immersion blender. Garlic should be cooked until it's just aromatic. If it cooks too long it becomes bitter and can ruin the flavor of the soup. 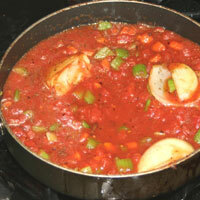 Be sure to have the tomatoes next to the pot so they can be added just after you start to smell the garlic. 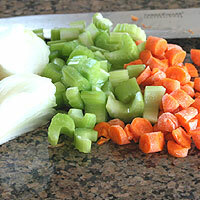 My soup preference is to puree the vegetables and have firmer things in larger pieces. Onions, tomatoes, carrots, and celery I usually puree. Meat, potatoes, lentils, or orzo I leave in whole. I enjoy it more and my kids are much more likely to eat it. 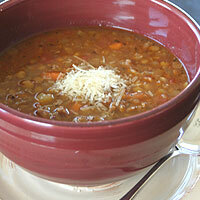 Red lentils are softer than brown and have a sweeter flavor. They thicken the soup nicely and give it a great flavor. If you can't find them, you can use brown. Rinse brown lentils according to package directions. Add lentils, bay leaf, and chicken broth. 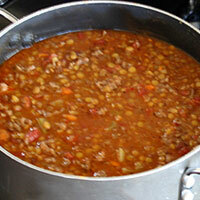 Reduce heat and simmer 30-45 minutes until lentils are tender. Remove the bay leaf. Add sausage and stir well. Brown lentils are firmer than red when cooked, so I like to keep them whole. Serve with a sprinkle of parmesan on top. Too salty- Substituting chicken broths for stocks can give you a salty soup. Just leave the additional salt out or add it a bit at a time to taste. 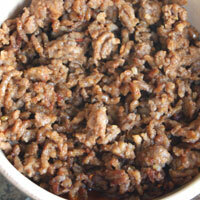 Tasteless meat- I like to brown meats for soups then set them aside until the soup is finished. Doing this works the flavor of the meat into the soup, but does not drain the meat itself of its flavor. I don't like to bite into meat and taste nothing. The flavors of the soup should mesh, but the meat should hold it's own flavor and compliment the soup. No sausage- The soup really lacks if the sausage is left out. I'm sure there are a lot of good vegetarian lentil soups out there, but the sausage in this one is a must. 1. Heat a large pot over medium/high heat. Brown sausage and cook through stirring occasionally. (1)Remove sausage from pan and set aside until right before serving. Refrigerate it if it will be several hours. 2. While the sausage is browning. Chop the onion, carrot, and celery and set aside. Measure the garlic and spices into a small bowl and set aside. Return the pan to medium/high heat and add the olive oil. 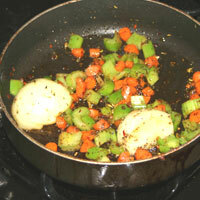 When oil is hot, but not smoking add the onion, carrot, and celery. Cook stirring frequently 5-7 minutes. Lower heat if vegetables are browning excessively. 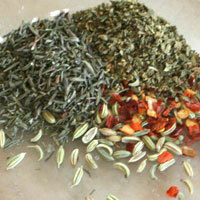 Add the garlic and spices and mix well until the garlic is (2)aromatic. Add tomatoes, red lentils and half the chicken stock. Simmer 15 minutes. 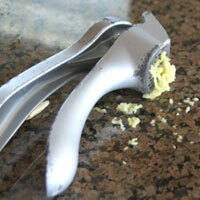 (3)Puree using an immersion blender. Or transfer to a blender and puree. 3. Rinse brown lentils according to package directions. Add lentils, bay leaf, and chicken broth. 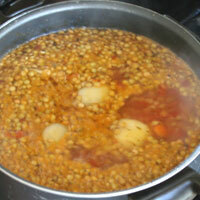 Reduce heat and simmer 30-45 minutes until lentils are tender. Remove the bay leaf. Add sausage and stir well. Serve with a sprinkle of parmesan on top. This soup freezes well. 1. I like to brown the sausage first in the pan so the vegetables can have the sausage flavor. I then remove it so it retains it's flavor. If it simmers in the soup for an hour it drains the taste and leaves it rubbery. Also, this soup is mostly pureed and you don't want to puree the meat. 2. Garlic should be cooked until it's just aromatic. If it cooks too long it becomes bitter and can ruin the flavor of the soup. 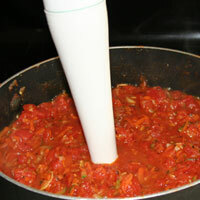 Be sure to have the tomatoes next to the pot so they can be added just after you start to smell the garlic. 3. My soup preference is to puree the vegetables and have firmer things in larger pieces. Onions, tomatoes, carrots, and celery I usually puree. Meat, potatoes, lentils, or orzo I leave in whole. I enjoy it more and my kids are much more likely to eat it. 4. Red lentils are softer than brown and have a sweeter flavor. They thicken the soup nicely and give it a great flavor. If you can't find them, you can use brown. 5. 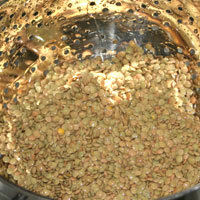 Brown lentils are firmer than red when cooked, so I like to keep them whole.